"THE VANISHING MIND SERIES: IN LOVE AND LOSS"
"NORDIC ODYSSEY: A MONTH AT SEA"
"JEFF HARRIS: 4,748 SELF-PORTRAITS AND COUNTING"
"INSIDE SYRIA: ONE HOSPITAL'S STORY"
Every day, about 70 to 100 patients would pass through the doors of Dar al Shifa hospital, 80% of them civilians. But today, this hospital that once saved so many lives lies in ruins. On November 21, a government air raid destroyed the building claiming 40 lives. This was not the first attack, but, for Dar al Shifa, it will be the last. This multimedia story and video package documents life in the hospital while it was still functioning, and the struggle of the few remaining doctors, like Doctor Osman, trying to cope with hundreds of patients per day that would arrive without let up. The hospital’s staff were mostly volunteers – teachers, housewives veterinarians. They would tirelessly work around the clock, barely leaving their posts even to sleep or eat. Now that the hospital has been destroyed, the blood and the misery continue elsewhere in make shift secret hospitals dotted throughout Aleppo. 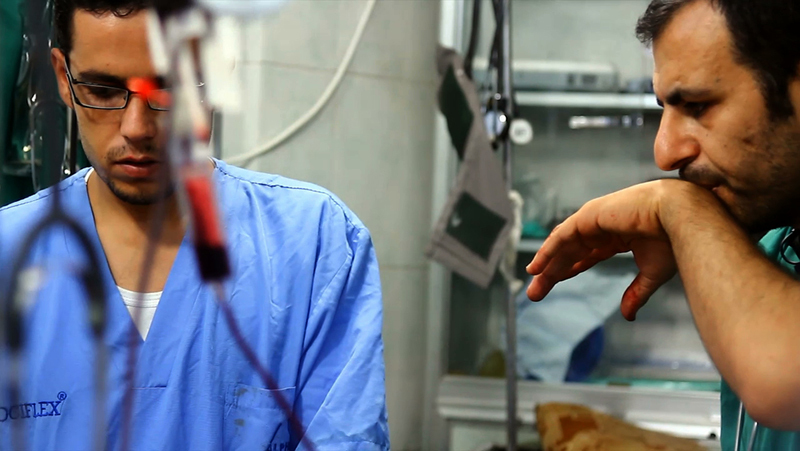 Dr Osman survived and still treats Aleppo’s wounded, but many of his colleagues did not. This is a tribute to the courage and self-sacrifice of this inspiring medical team.